Sprinkle plum tomatoes on both sides with salt. Place on paper towels to drain. Flip onto a dry section of the paper towels and drain another 15 minutes. Blot dry with paper towels. Heat olive oil in a skillet or saute pan over medium-high heat. Add the zucchini and cook 3-5 minutes, stirring occasionally until slightly softened and lightly browned. Toss with Italian seasoning and season with salt and black pepper to taste. Allow to cool to room temperature. Place half of the naan pieces in the prepared baking dish. 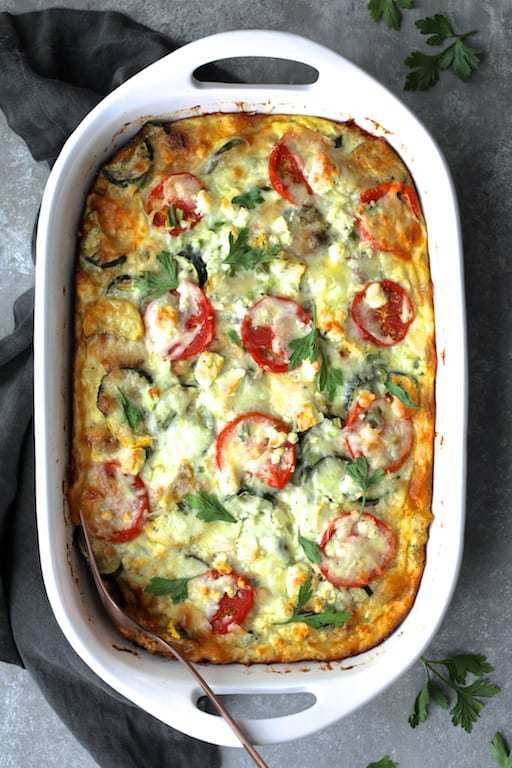 Top with half the zucchini, half the tomatoes, half the scallions and half of the cheeses. Repeat layers one more time. Whisk eggs and milk together in a bowl. Season with salt and pepper if desired. Pour over the layers, cover and chill for at least 2 hours or up to 24 hours. Bake uncovered 45-50 minutes or until set. Let stand 5-10 minutes before serving. Cut into squares, garnish with snipped parsley and serve.